When The Fuller Center for Housing dedicated its first house in the Nepalese village of Trishuli this month, it marked the furthering of a mission that had once been aborted because of pressure from communist rebels. 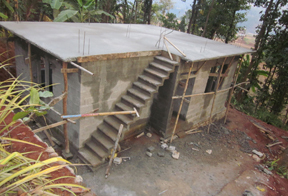 The recent dedication of Deepa Tamong’s home in Trishuli is not only evidence of a now-thriving operation in Nepal, but also it is a testament to Fuller Center founder Millard Fuller’s determination — and the determination of those who have worked with him in the affordable housing ministry. 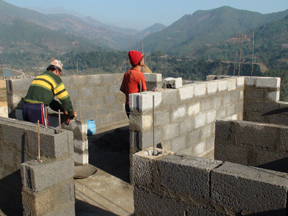 When The Fuller Center for Housing began its very first international project in Nepal in July 2005, the monarchy was under siege by Maoist rebels, who were intent upon thwarting what had quickly become a thriving build project in the town of Siraha. The project was the brainchild of a Georgia man who’d visited the area on a mission trip. During the dry season, the area’s communities of wooden and bamboo homes were almost annually struck by series of fires. Intent upon putting a stop to the cycle of thousands of house fires each year, he met an engineer who came up with a simple system to build fire-resistant homes. He brought his concept to a man he didn’t know personally but he had heard might be of some help — Millard Fuller. In Nepal, where we were building 100 houses for families who lost their homes in a devastating fire, the work began with laying foundations for the first 18 houses. Those houses were going up with the walls about half-built, and the local Maoist rebels came in, kidnapped our construction supervisor and ordered that all work cease. Fortunately, the supervisor was returned the next day unharmed. Civil unrest was countrywide, with the main complaint being that people wanted parliamentary democracy and to vastly curb the power and influence of the king. With this pressure mounting, the king did agree to step aside and allow a parliament to form. We felt the rebels had gotten what they wanted, so we started building again. Within days, the rebels returned and tore down all of the new construction. For some organizations, that might have signaled the end of the mission. But Fuller, Snell and Fuller Center officials merely regrouped and waited for dust to settle after King Gyanendra stepped aside, paving the way for a democratic republic. In Kankad, The Fuller Center found a similar need as was seen in Siraha: recurring home destruction. But in Kankad, it was flooding, not fires, repeatedly devastating the community. Kankad, in the hard-to-reach far western area of Nepal, is comprised of the native Tharu, a unique subset of the Nepali population. They’re their own tribe with their own language and own customs. The word “kankad” means “sand” in their language and many in the area live on sandy riverbanks prone to flooding. But The Fuller Center worked with the government to obtain land on a hillside where more than 60 of the most exposed families will be relocated. With the caste system is firmly entrenched in predominantly Hindu Nepal, the Tharu have long been underprivileged and looked down upon by generations of their countrymen. Their status is next to the lowest in Nepal’s caste system, just above “untouchables.” As such, it would be difficult for them to gain decent land and homes without the help of The Fuller Center. Strangely enough, recent medical evidence backs up the common belief that the Tharu have developed an innate resistance to malaria after living for centuries in the swampy lowlands. The Tharu have proven to be hard-working homeowner partners, even building their own blocks for The Fuller Center’s cement block homes. Snell said most of the block makers are women. While traveling to Kankad is difficult, requiring one to fly from Kathmandu to Dhangadhi before riding through parts of India and back into Nepal, Trishuli is a bit easier to visit. Trishuli is roughly 50 miles north of the busy capital of Kathmandu, just off the Pasang Lhaamu Highway. Still, in a country that boasts eight of the 10 highest mountain peaks in the world, including 240 peaks over 20,000 feet, there’s no such thing as a simple drive. There’s something else that makes Trishuli different from many places in Nepal, where Hinduism and Buddhism are the only officially recognized religions and boast many followers — including many who practice a mix of the two. For now, Nepal is not a destination for Fuller Center Global Builders volunteer teams. But with one house finished in Trishuli, another near completion and a third site prepped for construction, Snell hopes that Trishuli will become a desired, if rare, destination for Global Builders. View more photos from our work in Nepal. Your donations help further our work in Nepal and around the world. Click here to donate. Growing up in the United States, even the lower mddile class United States where I started out, I’ve always found it hard to understand why someone would endure hardship for the sake of place, especially when there is family involved. Unfortunately, it’s reading that has taken the biggest beating in trying to post every day (and keep up with reading blogs), so I’m unlikely to read Fuller’s work, at least this year. But her voice (in your excerpts) sounds beautiful.